impulse calculates the unit impulse response of a dynamic system model. For continuous-time dynamic systems, the impulse response is the response to a Dirac input δ(t). For discrete-time systems, the impulse response is the response to a unit area pulse of length Ts and height 1/Ts, where Ts is the sample time of the system. (This pulse approaches δ(t) as Ts approaches zero.) For state-space models, impulse assumes initial state values are zero. impulse(sys) plots the impulse response of the dynamic system model sys. This model can be continuous or discrete, and SISO or MIMO. The impulse response of multi-input systems is the collection of impulse responses for each input channel. 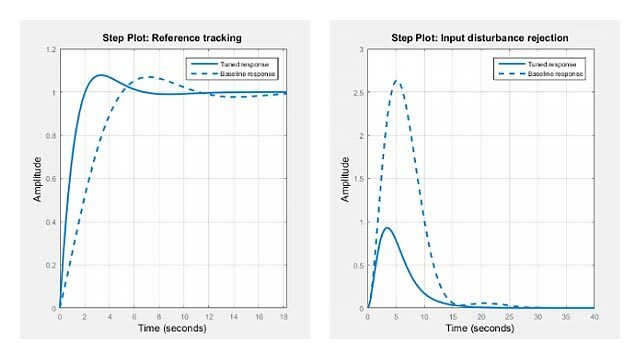 The duration of simulation is determined automatically to display the transient behavior of the response. 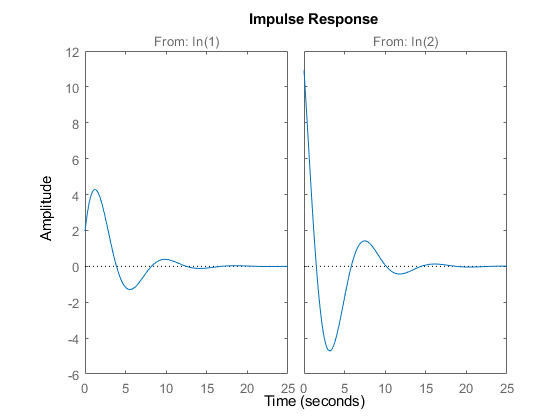 impulse(sys,Tfinal) simulates the impulse response from t = 0 to the final time t = Tfinal. Express Tfinal in the system time units, specified in the TimeUnit property of sys. For discrete-time systems with unspecified sample time (Ts = -1), impulse interprets Tfinal as the number of sampling periods to simulate. impulse(sys,t) uses the user-supplied time vector t for simulation. Express t in the system time units, specified in the TimeUnit property of sys. For discrete-time models, t should be of the form Ti:Ts:Tf, where Ts is the sample time. For continuous-time models, t should be of the form Ti:dt:Tf, where dt becomes the sample time of a discrete approximation to the continuous system (see Algorithms). The impulse command always applies the impulse at t=0, regardless of Ti. See "Plotting and Comparing Multiple Systems" and the bode entry in this section for more details. [y,t,x,ysd] = impulse(sys) returns the standard deviation YSD of the response Y of an identified system SYS. YSD is empty if SYS does not contain parameter covariance information. The left plot shows the impulse response of the first input channel, and the right plot shows the impulse response of the second input channel. Fetch the impulse response and the corresponding 1 std uncertainty of an identified linear system . The impulse response of a continuous system with nonzero D matrix is infinite at t = 0. impulse ignores this discontinuity and returns the lower continuity value Cb at t = 0. You can change the properties of your plot, for example the units. For information on the ways to change properties of your plots, see Ways to Customize Plots. is equivalent to the following unforced response with initial state b. To simulate this response, the system is discretized using zero-order hold on the inputs. The sample time is chosen automatically based on the system dynamics, except when a time vector t = 0:dt:Tf is supplied (dt is then used as sample time).